Jas Garner was born into a footy family; the type that arranged life and even where they lived, around the game. “I was born in Mt. Gambier, up in the country, but we moved down to Victoria when I was younger so we could go to AFL games,” Garner told North Media. But as a young girl, Garner wasn’t afforded many chances to play the game she loved. However her cousin asked his local club Yarraville to make an exception and let Garner join in. “I was the only girl playing for the first couple of years, but in the five years I was playing at the club maybe two or three other girls came through,” she explained. Garner took to the opportunity with both hands, and eventually the dial changed. “When I got to be 13 or 14 I had to stop playing, girls couldn’t play with the boys once we reached this age,” Garner said. “Being young, I thought, ‘well, that’s the end of footy for me.’ I didn’t know women’s footy even existed. 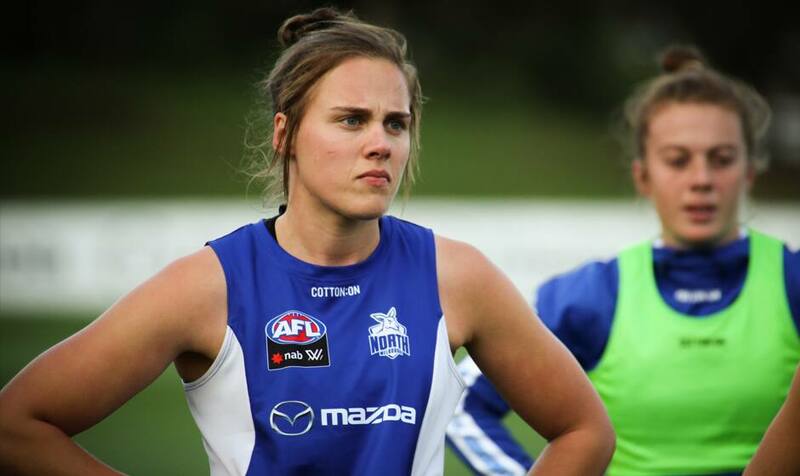 A year after hanging her boots up, a friend invited Garner to play with a girl’s under 18 team. Without hesitation she jumped right back into it. “Playing with that team was the most fun. I got to represent Victoria and travel to Perth and the Gold Coast, I made heaps of friends … it was pretty cool,” she said. Despite an increase in female participation, the pathways still weren’t clear. But that didn’t stop Garner. When the AFLW started in 2016 Garner was drafted to Collingwood at pick 86. Garner’s footy journey is a testament to her perseverance, resilience and her love of footy. But as equal opportunity in AFL for men and women starts to rise, it’s important to continue pushing equality in all aspects. This week people around the globe will be celebrating Women Human Rights Defender Day and International Day for the Elimination of Violence Against Women. We know that gender inequality is the leading cause of violence against women, so at the North Melbourne Football Club, we continue to strive for promoting gender equality, within our walls and outside of them. From women like Jas Garner, who, when faced with the option of not doing what she loved, decided to join the boys and make her dream a reality, to our Gender Equality Action Plan, which outlines specific and measurable ways we can make change, North is committed to equality.